I love meeting new people and was so lucky to meet Liz Dee through my good friend Ted Rubin. 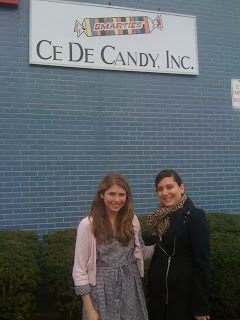 Liz is a 5th Generation Candy Maker and one of the sweetest people I know.. no pun intended!! She was nice enough to invite the Dj team out to the Smarties Factory Last week for a VIP tour. It was such a great time meeting their team and some of the Dee family members who work at Smarties!! And of course seeing the colorful office! Can’t wait to see you again soon Liz aka DJ Smarty!! Thank you again! p.s. Also more to come on my tour with Liz and the Smarties Team when my exclusive series Behind The Seams with Stacy Igel airs on Lockerz.com in December! Stay Tuned! p.p.s. Find out the WINNER of our favorite Smarty Pants Contest by Clicking HERE!! :) Check her out!! Q&A with Jody Lee from Agoura High School! Tip of the day for young designers! Tips of the Day! Entrepreneurial guidelines 2.0..